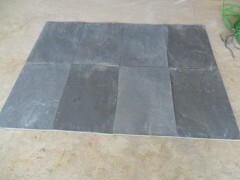 stone Name : China black slate, Slate Slab. Paving stone, tiles, slate, wall panels, wall cladding, Mosaic, Irregular random slate. Usage: Decoration buliding, Landscaping, Our slate will help your building more elegant. Thickness(cm): Different products we can make different thickness, Welcome to your own Size. For sure, we will according to our experience give you a suggestion. Package: 100% export stardard safe packing, seaworthy Fumigate s wooden crate; carton box and Fumigate crate. Payment: (1) T/T : 30% down payment and when we shipped the cargo and after sending the copy shipping document ,then you pay the other 70% payment.